Download our Free white paper on workforce planning strategies and learn how to optimize labor capacity and spot unused capacity that drives up costs. According to the Bureau of Labor Statistics, workforce costs––including payroll and benefits, incentive compensation, contract and temporary help––account for nearly 70 percent of total operating costs. Add to this the other expenses related to headcount, such has travel, computers, and communications, and [G1] workforce planning can account for well over 80 percent of operating costs. Unfortunately, the workforce planning picture is often a moving target. Labor market volatility, disruptive technologies, and limited organizational flexibility can all impact a business's attempt to right-size its labor force. Constantly trying to achieve this balance between costs and productivity is no easy task; at least, not without taking the right approaches, namely agile techniques that allow for dynamic labor planning. Our white paper provides an inside look at agile workforce planning strategies that can help your company shore up margins without sacrificing customer service or brand value. Learn more about strategies designed to help right-size your workforce. 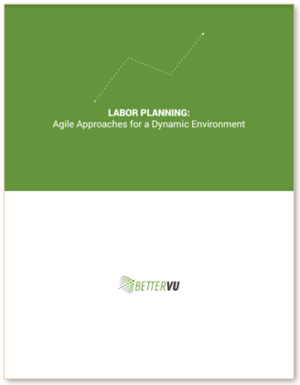 Download our white paper, Labor Planning: Agile Approaches for a Dynamic Environment, today! BetterVu works with leading companies to design and implement innovative workforce planning solutions utilizing the cloud-based Anaplan platform. Our focus is on high-value, cost-effective deployment where your team is integral to the design and build of the solution.